My first memories of fishing are sitting on the dam wall with my Dad, legs dangling above the roaring River Tigris, Iraq. We caught pretty silver fish on a rod he had made from a Tank aerial, and before leaving for the three mile cycle ride across the desert road.. we hunted Terrapins in the shallows. I was six years old and soon to return to England. Float fishing for Roach etc.. my Father had a knack of finding a river with a Pub running through it ! Then New Zealand.. Kahwai, Snapper and of course, Trout. I was fascinated with the art of casting, so beautiful, and the fur, feathers and tinsel to create a natural looking deception .. just add a hook and that's probably a fair description of me !! Some would say ! I still can't cross a bridge without stopping and having a gaze into the water.. and wondering ! This shot of the "usual suspects" was taken at Nythe Lakes, Hampshire by photographer Martin Reidl (who did the fabulous black n whites of Jerry Hall and much more !!). Thanks Andy Scott and Kevin Smith for sending us this picture. Back row: Henry Morris, Jon Dent, Andy Scott, Doug Lock (deceased - he was Justin Haywards guitar man, and much more, bless him). It was late season, the guys and I had met up in London early for a jaunt to the legendary Avington.. a series of chalk stream fed lakes in Hampshire. The chalk stream is the Itchen.. one of the best in Southern England . So,we rock up, set up our gear and go fishing. I caught a 10 pound Rainbow from the middle lake on a Damsel Nymph, relaxed and watched Pip for a while.. sometimes it's good to sit back and watch your friend having fun! I decided to go back to the Hut, weigh my fish and roll a joint. On my way, I glanced at the lake and saw a shadow maybe 20 yards out, above a gravel bed in the weed rich crystal water. I got away from the bankside, took my gear up to the woods and returned with my rod and landing net. On my leader was a size 10 Black Leach fly I'd tied myself.. so a few false casts to get the range and.. the fly falls short but the shadow bristled, gills flaring. Another cast lands perfectly, an inch or two in front of him.. and he goes for it! A bow wave following turns into a solid thump and all hell breaks loose.. bloody great thing jumping all over the lake.. reel screaming, heart thumping and a few other anglers watching my efforts. Eventually the fantastic fish tired, and with one leg in the lake, I netted it. A huge trout, easily bigger than I'd ever caught, glistening in the Autumn sun. I quickly killed it with my priest and went to the fishing hut to weigh it on their scales that were hanging from a beam! 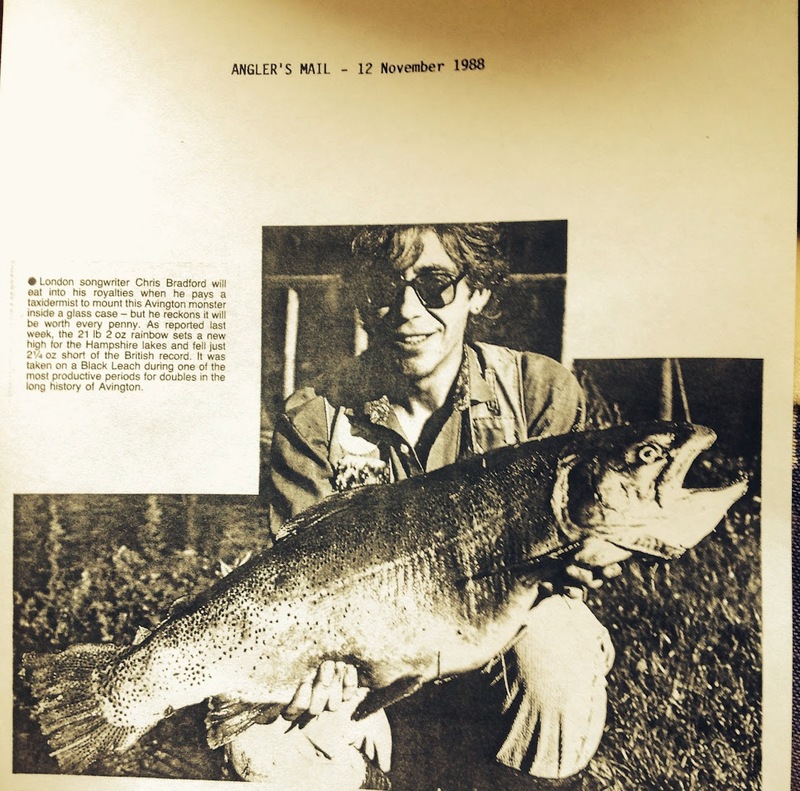 Next thing I know the Press are on their way, Anglers Mail and some local papers, so photos and interviews for me, it was a new British record fly caught trout.. 21 pounds and a bit.. so says the legend Peter Stone.. angler and taxidermist who mounted this great fish.. good enough for me ! So, it was a great day, Pip had a lovely 19 pounder, a lot of fuss and excitement at the end .. good fun in the Pub before heading back to Town. All wild fish I catch in rivers are returned safely.. not even one for the pot! However, we love to eat trout which is where our wonderful Stillwater fisheries come in, providing great sport and something to go with your chips ! Also.. I get as much joy from a pound brownie in a stream as I do from the huge trout I've just described. Just another day with the RRFF.. there are plenty more tales ! Chris’s biggest trout - 21 pounds ! Back row: Jon Dent (graphic designer), Chris, Henry Morris..
All great chums and they got paid for a great days fishing.. and modeling those classy looking fish ties! Left to right: Tobi Corney, Chris, Nick Rootes, Henry, Paul Dunn ( photographer ), Jon Dent. "A great day at the Oxfordshire lake, Bushyleeze. We'd been invited to fish a charity event for Heartclic.. other celebs included Geoffrey Palmer, an actor I'd admired for sometime. We had a nice natter and then set about raising money for this worthy cause, Heartclic. Chris Tarrant was there with his ghillie! He kept everyone amused, and again was good company. None of the RRFFs can remember if they actually caught a trout. . . didn't seem to matter really !! " Left to right: Paul, Tobi, Henry..
"The Rock n Roll Flyfishers had arranged a trip to Nythe Lakes, Hampshire. 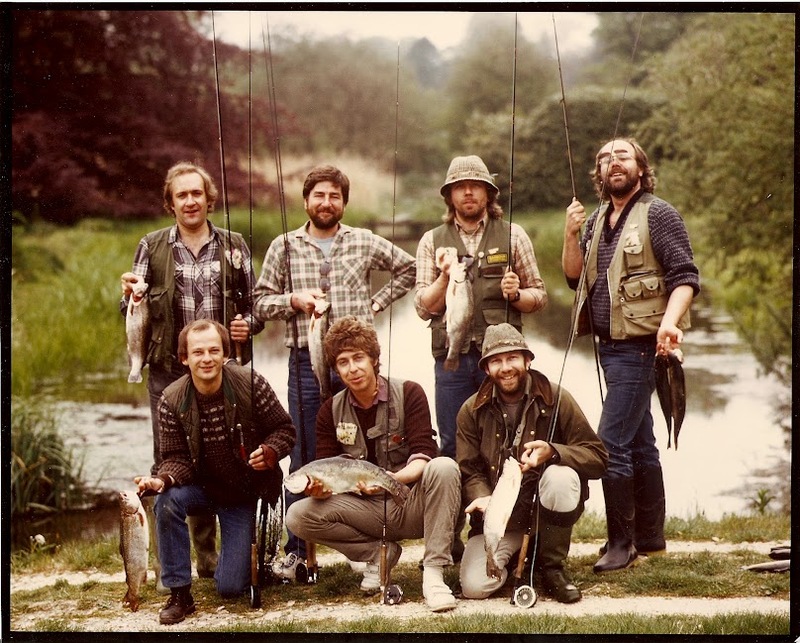 Pip was working with Eric Clapton who loved his fly-fishing and still does. So he invited him to join us for the day. Eric rocks up and soon hooks and lands a nice trout 20 yards from me. Well then, first fish of the day and I was there to congratulate him - shake his trouty hand, and introduce myself properly. We all went to the local pub for lunch and soon after, a Limo came to take him home. A wonderful, modest guy and a fair caster ! We ( the RRFF) would have considered him for membership had he not been so busy with that bloody guitar." Early 60s Dad and I took Mamaru, his home built motor boat, out into the beautiful, unspoilt depths of Tarawera, the Seagull engine putt putting away. We were trolling a Toby spinner we'd had results with on Taupo a week earlier. So, we're poodling around in this amazing Volcano, surrounded by Maori legend and history, and not a take! This lake is extremely deep so Dad suggests letting all the bloody line out and get down to the depths. Within minutes the reel was screaming and I was playing a wonderful wild Rainbow of 6 pounds plus. This fish had a lot of lake to fight in and took full advantage.. but we finally netted it and made our way back to the pumice strewn shore. That was a great fish, in the early days of my New Zealand fishing adventures . . . plenty of them as well. "Drinks break on the Rangitikei!" "Chris and young brother Jeff on Lake Taupo.. in 'Mamaru' the boat that Dad built." We swam and fished on this exact stretch of the Rangitikei River, just outside of Bulls, a quiet, almost cowboy New Zealand town in the early 60s which was home. My young brothers and I rode the rapids and lazy bends for 18 miles of the Rangitikei in "Mamaru" - the Blue Coffin that Dad built. We spilled out at Tangimoana - the river mouth where Mum was waiting for us in our Humber Hawk, with the boat trailer that Dad had also made! It was all a bit Huck Finn meets Tarzan in those days.. and I loved it!! Eddington Lake, Nick Rootes and the River Kennet. About 1974 I made a lifelong friend, Nick Rootes. We had wonderful hippy fun together and he turned me on to some amazing fly fishing. Glenalmond Loch and the River Almond, on his late fathers estate in Perthshire.. the bothy and whisky! And the enchanting Eddington Mill.. a stretch of the River Kennet and the lake. I spent many great days with Nick and the family, my early days "proper" fly fishing, the fishing hut is still a fishermans dream.. we hung out there a lot, doing RRFF things ! During these heady days we fished another lake on the estate, Oakhill.. my first 6 pounder and where Nick walked straight off a small jetty into the lake.. apparently I'd distracted him at the vital moment.. whatever.. in he went! Much to his delight, he witnessed me being butted with attitude into Duncton Mill Lake, Sussex! A huge Ram snuck up behind me with attitude. I got soaked, but cared for by the fishery manager, Graham, who lent me some clothes and introduced me to his home Cider! Nick of course, loved this.And the pretty River Dun, winding gently, Nick and I on our knees, nettles and wildflowers . . catching nice Rainbows and Browns on nymphs . . so many Berkshire stories . . thanks Nick and Dot. Scotland: Perthshire - Nick Rootes and Glenalmond. Glenalmond Loch, tranquil and mysterious, full of butter gold brown trout eager for a wet fly! Behind the trees the gentle roar of a waterfall.. Buchanty Spout that pounds into the River Almond where we watched salmon jumping the falls.. the track is through the ancient Arboretum and down to the stream, magical at 6 in the morning. We caught 1lb Brownies from the Loch on "Gold Butchers" before returning to the boathouse and parking up the punt! Clean the fish and head back for a fine breakfast cooked in butter and slabs of bread! My first trips to the estate were family affairs.. sometimes an overnight train from London.. later, as Nick became friends with the RRFF, he invited us all to stay, in beautiful Perthshire . . a Boys Own Adventure I'll tell when I get Pip, Henry and Nick's version of the events. And The Drumtochtie Tavern, good friends and whisky after a great fishing day. A week of magic for us all, then of course, back to London, where we were all doing pretty well in the RR part of RRFFishers! Henry, Henry's hilarious fly and Andy. Andy, Chris and John Hyde Parker..
John was a wonderful guy, sadly no longer with us but still well loved. He adored the fishing adventures we all shared and knew the meaning of fun. John Hyde Parker and Henry, Minstrels Cottage, Chris’s wedding reception. Chris and Henry.... Duncton Mill, Sussex. Lizzie, Chris's wife, true love, inspiration and fishing ghillie..
Chris and Henry.. veterans and founder members of the RocknRoll Flyfishers.. still fishing together April 17th 2018 ! What have all these iconic musicians in common? Eric Clapton, Elton John, Steven Tyler, Reba McEntire, Lady GaGa. Mars is their ruling planet (if that's your cup of tea).